Home » Basketball » State of the Knicks- Meh! State of the Knicks- Meh! If you remember anything, did anything actually happen? The New York Knicks went 2-1 last week, but nothing EXCITING happened on the court. The Knicks got their SECOND road WIN of the season over the Nets on Thursday night, BUT Kristaps Porzingis got injured again and did not play the rest of the week. Porzingis’ injury was the main TAKEAWAY from this week and also the Knicks RUINING the homecoming of Carmelo Anthony. The Knicks have some TOUGH games this week including a Christmas Day game against the Philadelphia 76ers which will be fun to watch. The Knicks start playing A LOT of road games after this week and they have STRUGGLED on the road thus far this season, so maybe that will be the DOWNFALL of the Knicks? The Knicks took on cross town RIVALS, the Nets and the Knicks’ head coach Jeff Hornacek treated that game differently, which was really SMART. He made the players stay in a hotel in Brooklyn the night before the game and have their morning SHOOT AROUND in Barclay’s Center. thus treating that game like a ROAD game, which is where the Knicks have STRUGGLED. Even though, the coaching staff tried to treat that game as a true ROAD game, majority of the crowd at the game was Knicks fans so it was not a true ROAD game for the Knicks and they won that game easily. For the time being, it looked like their ROAD woe’s were going to be SOLVED, but they got BLOWN OUT by the Hornets in Charlotte on Monday Night and their ROAD woes continue. After the Christmas Day game against the 76ers, the MAJORITY of their games for the next MONTH are on the ROAD and if their woes continue, than that is when the Knicks’ season will go down the DRAIN. This week they play the Detroit Pistons on the ROAD on Friday night, and they need to WIN that game to install some CONFIDENCE into the young players on the team. The game against the Pistons is the back end of a double header, as the Knicks play the Boston Celtics at HOME tomorrow night. The Knicks have played really GOOD at HOME and that was evident when they beat the Thunder on Saturday Night. 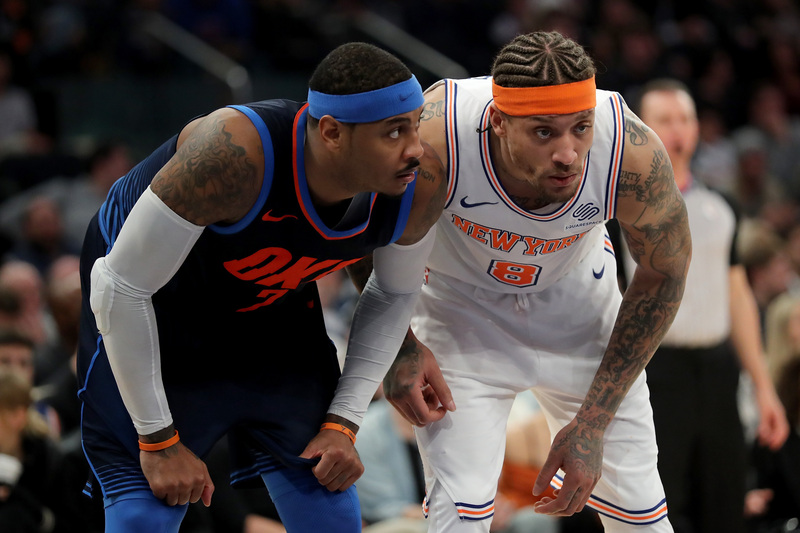 It was going to be an EMOTIONAL game for both the Knicks and the Thunder as it was the first game BACK in New York for Anthony and he was BOOED throughout the game by the SELLOUT crowd at Madison Square Garden, which helped the Knicks WIN comfortably. The Knicks will need a similar reaction from the HOME crowd tomorrow night against the Celtics, who are the BEST team in the Eastern Conference right now. The game against the Celtics will be a great BENCHMARK for the Knicks and they will get an OPPORTUNITY to see how FAR they are from the ELITE teams in the NBA. The status of Porzingis is UNKNOWN for that game, and the Knicks NEED him IF they want to WIN that game. The Knicks END next week with a HOME matchup on Monday afternoon against the 76ers which KICKS OFF the NBA’s Christmas Day slate of games. The Knicks and the 76ers are pretty much the same team and the Knicks SHOULD WIN that game to build some momentum going into their ROAD trip. Both teams have very YOUNG rosters so it will be INTERESTING to see how they react to the BIG stage of playing on Christmas day. As I said earlier, nothing EXCITING happened with the Knicks, but that will change this week as they some BIG games this week. IF the Knicks go 2-1 or BETTER this week, then I am fully back on them once again, but I DO NOT think they will be able to WIN two games this week. The Knicks have been missing Tim Hardaway Jr. over the past FEW weeks, who has been out with a knee INJURY. Reports were surfacing over the last couple of days that he could be back SOON and that will HELP the Knicks on their ROAD trip starting next week. Hardaway Jr. had become the Knicks’ SECOND option on offense behind Porzingis and no wonder why the team has been STRUGGLING when both players have been OUT this week. The report this morning out of Turkey was that the prosecutors are looking to put Enes Kanter in PRISON. The controversy between Kanter and Turkey’s President Recep Tayyip Erdoğan has been ONGOING since the offseason and it is definitely something that has been in the HEAD of Kanter this season. This situation is still very FLUID and there are a lot things that we do not know, but this story is one to keep an eye on over the next FEW months to see how it plays out for Kanter as a human and also his FUTURE with the Knicks. The Kanter story is the big news coming out of the Knicks right now and it will be INTERESTING to see if they make a statement about this situation, other than that the Knicks need to KEEP WINNING.